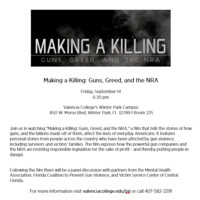 Join us in watching Making a Killing: Guns, Greed, and the NRA, a film that tells the stories of how guns, and the billions made off of them, affect the lives of everyday Americans. It features personal stories from people across the country who have been affected by gun violence, including survivors and victims' families. The film exposes how the powerful gun companies and the NRA are resisting responsible legislation for the sake of profit - and thereby putting people in danger. Following the film there will be a panel discussion with partners from the Mental Health Association, Florida Coalition to Prevent Gun Violence, and Victim Service of Central Florida.